Alterations have the power to turn an okay garment and transform it into something that looks like it was made just for you. In this time of “fast fashion” and disposable clothing, many women don’t want to invest the money in a high-quality garment that doesn’t fit them correctly. One of the fantastic things that we do here at Isle of Skye Cashmere is offer free alterations on garments bought in the store. I highly recommend taking the time to tailor your clothes so they fit you like a glove. Although proper fit is the primary reason for tailoring, alterations can also help to modernize your clothes or update them to line up with your evolving sense of style. One of the most common garments that need to be tailored to ensure a correct fit are blazers. Our blazers that are made with Loro Piana cashmere are beautiful – but with proper tailoring, they become extraordinary! 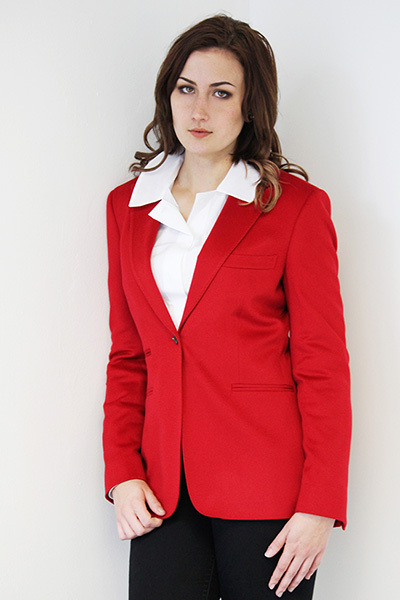 Our seamstress, Chanta, has many years of experience working with these fantastic blazers. Tailoring your clothes can help you cultivate a wardrobe filled with things that you love to wear! We tailor clothes bought in the store as well as clothes bought elsewhere. We’d love to help you perfect your wardrobe. While browsing through recent runway shows (such as Prada, Chanel, and Dior) I noticed a recurring theme: jewel tones. These ruby, sapphire, emerald, and citrine colors were bold, yet sophisticated. I believe that the easier, and sometimes better, way to wear color this fall is to pair it with neutral colors. Against a neutral palette, the colored piece(s) you choose to wear will really pop! A couple of ways to incorporate color into a neutral-colored outfit would include: wearing a pair of shoes that coordinate with your purse/clutch, wearing a bright colored coat, or even a chunky, colored necklace. Even makeup and nail polish will allow you to wear color. In the photo, I styled the model with a pair of our DL1961 jeans in a black wash, a button-up white blouse, a red cashmere V-neck sweater, and a red cape that I made. 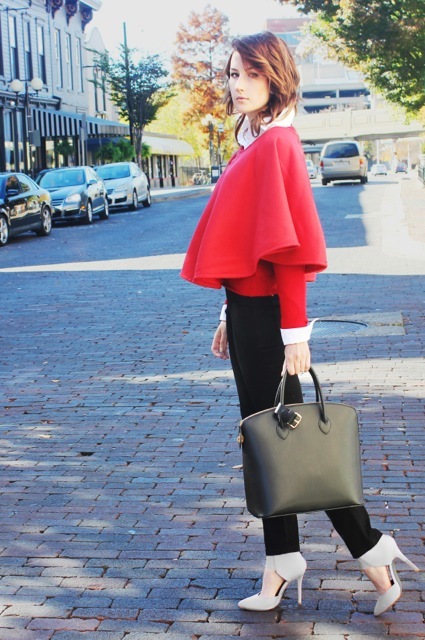 The pop of the ruby-red in the cape and sweater really ties her outfit together nicely. Don’t retire your colors just because summer has ended for the year. Find fun ways to incorporate your colored pieces into your Fall/Winter wardrobe and you won’t regret it! Come in Wednesday through Friday from 10 AM to 5 PM and Saturdays 10 AM to 4 PM to see our amazing sweaters in fantastic colors!